Wild & Lye is well established estate agency specialising in Residential Sales, Lettings and Property Management. We understand that Letting your property, especially for the first time, can be a worrying experience and so our most important consideration is providing you with the best possible service and the right Tenant for your property. We never forget that the property is your most important asset and we can confidently assure you that by instructing us to act as your Letting and Managing Agent your property will be in professional and caring hands. As a small business we are able to offer a personal and friendly service whilst maintaining a high standard of competence and professionalism. Since opening in 1990 we have established a good reputation in Bath and a lot of our business comes from recommendations. Our fully inclusive service includes marketing the property and carrying out viewings leading to the introduction and referencing prospective Tenants. This proving satisfactory, we will then go ahead and prepare the Tenancy Agreement and an Inventory & Schedule of Condition. The Tenants will then be checked-in against the Inventory & Schedule of Condition. During the tenancy we carry out periodic inspection visits. Should these bring to light any maintenance issues, we will recommend, oversee and account for any necessary repairs. Collecting and processing of rental payments is also part of the service. These will be credited to the Landlord's bank account less our agreed fees and any maintenance costs. Towards the end of the tenancy, we will liaise with the Tenants and renew the Tenancy Agreement or arrange to check them out as applicable. This service is suitable for those Landlords who are not residing locally or would rather not deal with the Tenants directly, preferring all aspects to be handled by a professional Agent. Our fee for this service is a one-off payment of 60% (50% + VAT) of one month’s rent and 9.6% (8% + VAT) of the rent received. 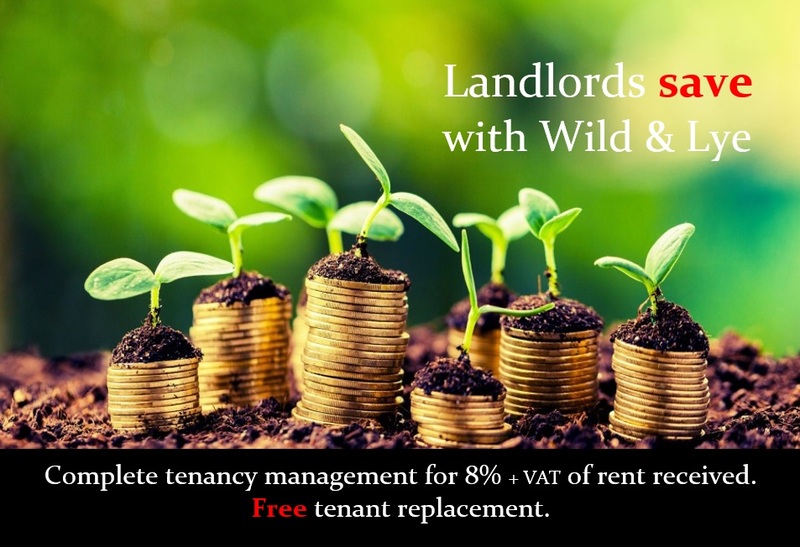 When Wild & Lye are instructed to fully manage your property there is no charge for subsequent Tenant introductions – a huge saving when compared to other Letting agencies. Our Letting Only service includes marketing the property and carrying out viewings leading to the introduction and referencing of prospective Tenants. This proving satisfactory, we will then go ahead and prepare the Tenancy Agreement. Following this, the first month's rent will be collected and credited to the Landlord less our agreed fee. Managing the tenancy, including the maintenance and rent collection, will then be the responsibility of the Landlord. Our fee for this service is 60% (50% + VAT) of one month’s rent. We firmly believe that a good relationship with Tenants is the key to a smooth-running tenancy. As property managers this relationship is our job, but it is important that the Tenants should feel comfortable in their temporary home and that they are receiving value for their money. It follows that a well presented and maintained property in a good decorative order will go towards this whilst also achieving a higher rental figure. Tenants are also more inclined to treat such a property with greater respect. Electrical, gas, plumbing, waste, central heating and hot water systems must be safe, sound and in good working order. Repairs and maintenance are at the Landlord’s expense unless misuse can be established. Interior decorations should be in good condition and preferably plain, light and neutral. Your property can be let fully furnished, part furnished or unfurnished. Which of these is appropriate will depend on the type of property and local market conditions. We will be pleased to give you advice on whether to furnish or not and to what level. As a minimum you will need to provide decent quality carpets, curtains and light fittings. Remember that there will be some reasonable ‘wear and tear’ on the property and any items provided. Personal possessions, ornaments, pictures, books etc… should be removed from the premises, especially those of real or sentimental value. All cupboards and shelf space should be left clear for the Tenants’ own use. Gardens should be left neat, tidy and rubbish free, with any lawns cut. Tenants are required to maintain the gardens to a reasonable standard, provided they are left the necessary tools. However, few Tenants are experienced gardeners and, if you value your garden or if it is particularly large, you may wish us to arrange visits by our regular gardener. At the commencement of the tenancy the property must be in a thoroughly clean condition and, at the end of each tenancy, it is the Tenants’ responsibility to leave the property in a similar condition. Where they fail to do so, cleaning will be arranged at their expense. You should provide one set of keys for each Tenant. When we will be managing the property we will arrange to have duplicates cut as required. If your property is mortgaged you should obtain your Lender’s written consent to the Letting. They may require additional clauses in the Tenancy Agreement of which you must inform us. If you are a Leaseholder you should check the terms of your Lease and obtain any necessary written consent from the Freeholder or Managing Agent before Letting. You should ensure that you are suitably covered for Letting under both your buildings and contents insurance. Failure to inform your insurers may invalidate your policies. We can provide information about Landlords Legal Protection, Rent Guarantee Cover and Landlords Contents and Buildings Insurance if required. We recommend that you arrange for regular outgoings e.g. service charges, maintenance contracts etc… to be paid by Standing Order or Direct Debit. When we are managing the property, by prior written agreement, we may make payment of certain bills on your behalf, provided such bills are received in your name at our office and that sufficient funds are held to your credit. When we are managing a property we will arrange for the transfer of Council Tax and utility accounts to the Tenants. Meter readings will be taken, allowing your closing gas and electricity accounts to be drawn up. British Telecom will require instructions directly from both the Landlord and the Tenants. When resident in the UK it is entirely the Landlord’s responsibility to inform the HMRC of rental income received and to pay any tax due. When a Landlord is resident outside the UK during a tenancy, an exemption certificate from HMRC will be required before rental income can be received without deduction of tax at source by the Letting agency. It is most important that an Inventory & Schedule of Condition be prepared in order to avoid misunderstanding or dispute at the end of a tenancy. Without such safeguards, it will be impossible for the Landlord to prove any loss, damage or significant deterioration of the property or contents. Most tenancies will automatically be Assured Shorthold Tenancies (AST), provided the rent is under £100,000 a year and the property is let to private individuals. Tenancies are usually granted for an initial fixed term of either 6 or 12 months. When the fixed term has expired, the Landlord is able to regain possession of the property provided he has given two months written notice to the Tenant to coincide with the end of the Tenancy Agreement. In addition, if the Tenant owes at least two months or eight weeks rent on the property the Landlord can apply through the Court to seek a possession order. The following requirements are the responsibility of the owner (Landlord). Where you have signed our Full Management Agency Agreement they are also our responsibility. Therefore, where we are managing the property, we will need to ensure compliance. Under the Gas Safety (Installation and Use) Regulations 1998 all gas appliances and flues in rented accommodation must be checked for safety within twelve months of being installed and thereafter at least every twelve months by a competent engineer (e.g. a Gas Safe registered gas installer). Records: Full records must be kept for at least two years of the inspections of each appliance and flue, of any defects found and of any remedial action taken. Copies to Tenants: A copy of the safety certificate issued by the engineer must be given to each new Tenant before their tenancy commences or to each existing Tenant within 28 days of the check being carried out. There are several regulations relating to electrical installations, equipment and appliance safety which affect Landlords and their Agents in that they are 'supplying in the course of business'. They include the Electrical Equipment (Safety) Regulations 1994, the Plugs and Sockets Regulations 1994, the 2005 Building Regulation - 'Part P, and British Standard BS1363 relating to plugs and sockets. Although with tenanted property there is currently no legal requirement for electrical safety certificates, except in the case of all Houses in Multiple Occupation (HMO’s), it is now widely accepted in the Letting industry that the best way to ensure safety, and to avoid the risk of being accused of neglecting your 'duty of care', or even of manslaughter, is to arrange electrical inspections and the issue of safety certificates. There are two types of electrical inspection. One of the actual installation and another of any portable electrical appliances (PAT test). If your property is on 3 or more levels and let to 5 or more Tenants comprising 2 or more households (i.e. not all of the same family) it will be subject to mandatory licensing by your Local Authority. Whether mandatory licensing applies or not, if there are 3 or more Tenants not all related in any property it is still likely to be an HMO and special Management rules apply. Since 6th April 2007, all deposits taken by Landlords and Letting Agents under Assured Shorthold Tenancies in England and Wales must be protected by a tenancy deposit protection scheme. Landlords and Letting Agents must not take a deposit unless it is dealt with under a tenancy deposit scheme. To avoid any disputes going to court, each scheme is supported by an Alternative Dispute Resolution service (ADR). Landlords and Letting Agents can choose between two types of scheme; a single custodial scheme and two insurance-based schemes. If we are not providing our full management service we will normally transfer the Tenants’ deposit to you within 5 days of receiving it. You must then register it with a TDP Scheme within a further 9 days if the tenancy is an Assured Shorthold Tenancy. If you fail to do so the Tenants can take legal action against you, the Landlord, in the County Court. The Court will make an order that you must pay the deposit back to the Tenants or lodge it with the custodial scheme which is known as the Deposit Protection Scheme (DPS). In addition, a further order will be made requiring you pay compensation to the Tenants of an amount equal to three times the deposit. You will be unable to serve a Section 21 Notice on your tenant until compliance with the above conditions and the Court will not grant you a possession order. We have no liability for any loss suffered if you fail to comply. Be sure to comply with these requirements fully and accurately because penalties to the Landlord for non-compliance are heavy. 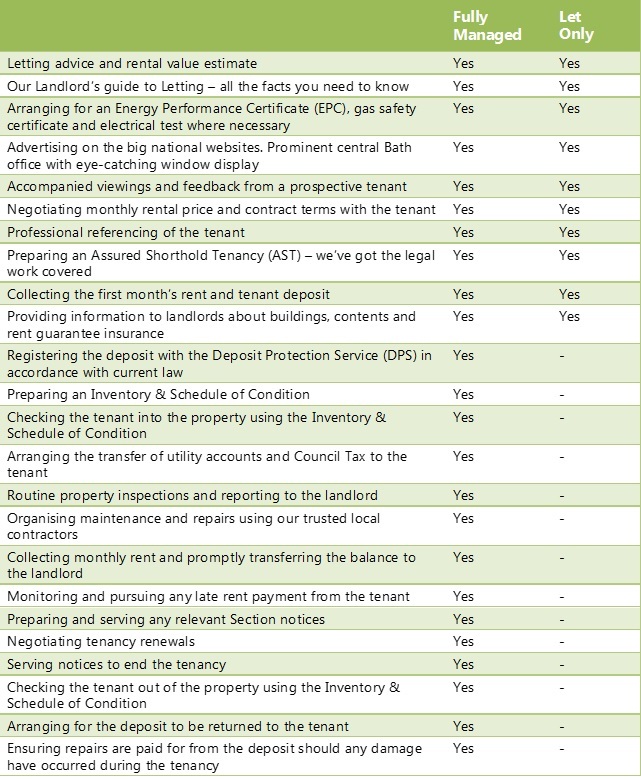 Where we are providing our full Letting and management service we will organise all of this for you. The DDA 2005 addresses the limitations of current legislation by extending disabled people's rights in respect of premises that are Let or to be Let and commonhold premises. Landlords and managers of Let premises and premises that are to be Let will be required to make reasonable adjustments for disabled people. Under the new duties, provided certain conditions are met (for example, that a request has been made), Landlords and managers of premises which are To Let, or of premises which have already been let, must make reasonable adjustments. A failure to do so will be unlawful unless it can be justified under the Act. Landlords will only have to make reasonable adjustments and they will not have to remove or alter physical features of the premises. From 1st October 2008 Landlords offering property To Let will be required by law to provide prospective Tenants with an Energy Performance Certificate (EPC) for their property. A new certificate will not be required on each Let since, in the case of rental property, EPCs will be valid for 10 years. The certificates (EPCs) will have to be provided free either when (or before) any written information about the property is provided to prospective tenants or a viewing is conducted. We have a database of registered energy assessors and we will be pleased to arrange an EPC inspection and assessment on your property upon request. Please note that we cannot market your property to let until we have in our possession a valid EPC for the property. We hope that the information covered in this guide will be of assistance to you. If there are any aspects of which you are unsure then please ask us. We look forward to being of assistance to you in the Letting of your property.